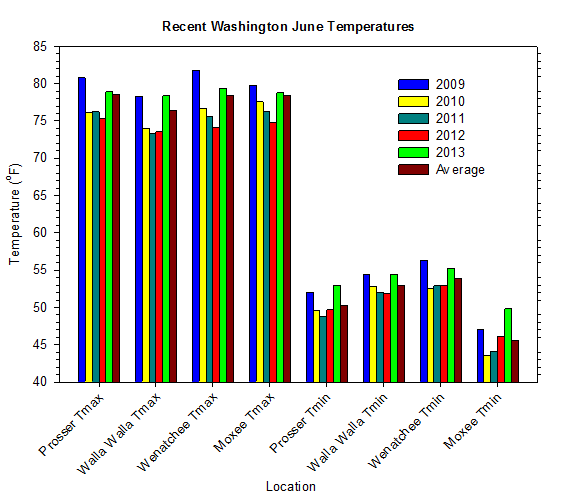 The trend of warmer than normal conditions in Washington continued during June. 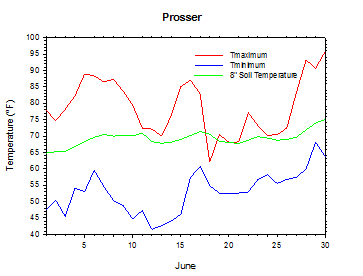 Average monthly temperatures at Prosser were more than 3 degrees higher than any of the past three June's, which further distances 2013 from the pattern in recent years of cool weather early in the growing season. 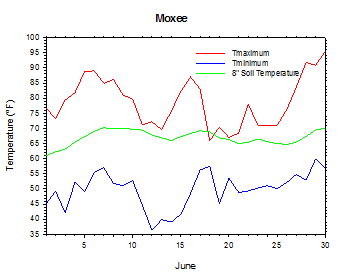 In fact, the June average low temperature at Moxee was 4.2 degrees above average, and the warmest since 1992. Although June began with dry and warm weather, parts of central and eastern Washington received several episodes of rainfall during the middle to latter part of the month, which was beneficial to the wheat crop. Unfortunately, the cherry crop was adversely affected in some areas, despite the utilization of wind machines and helicopters when possible. Around the state, temperatures were generally 1 to 2 degrees above average, while rainfall was highly variable. Despite some cool day-time high temperatures in rainy areas during the latter half of June, low temperatures were relatively mild. Highlights for the month included 0.75 inches of rain at Prosser on June 18th, 1.3 inches of rain at Green Bluff on June 20th, and a low temperature of 35 degrees at Harrington South on the 12th. The month ended with a major warming trend, as parts of central Washington topped 100 degrees on June 30th. Temperatures were seasonal at the beginning of June, with widespread 70s across the state. However, an upper low clipped eastern Washington on June 2nd, bringing rainfall and high temperatures only in the low 60s to eastern areas around Pullman and Spokane. High pressure became re-established statewide on June 3rd, which ushered in a prolonged period of sunny and warmer than normal weather. High temperatures on June 5th surpassed 90 degrees in parts of central Washington, while Vancouver hit 81 degrees. 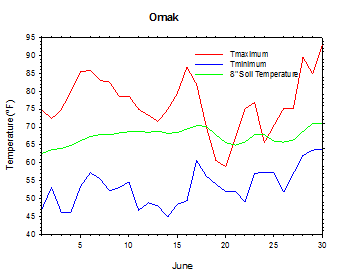 Low temperatures on June 6th were as warm as 68 degrees at Parker, while the high reached 93.4 degrees at Desert Aire. 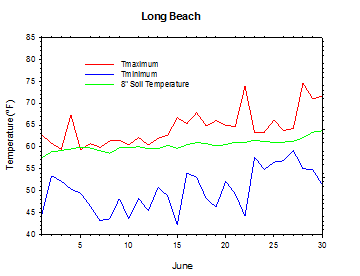 However, cooler marine air lingered at the coast, as Long Beach reached only 61 degrees. Slightly cooler air infiltrated eastern areas on the 9th and 10th, which was followed by more significant cooling on June 11th. Low temperatures on the 10th were as cool as 35 degrees at LaCrosse, while highs ranged from the 60s to low 70s in the west to the 70s to low 80s in the east. Clouds, breezes, and scattered showers occurred, especially in western areas. High temperatures on June 11th ranged from 59 degrees at Underwood to 81 degrees at South Tonasket. June 12th was a showery day in western Washington, while eastern areas were breezy and cooler but partly sunny. 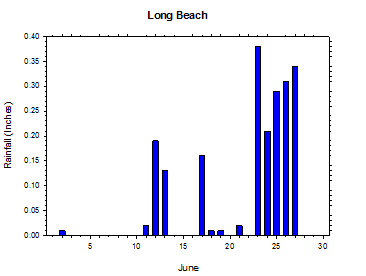 0.39 and 0.25 inches of rain fell at Tokeland and Long Beach. High temperatures were in the 60s in many locations, except 70s in central areas. Low temperatures on the morning of the 12th were as low as 34.5 degrees at Harrington South. Later in the day, the high temperature reached only 60 degrees at Underwood, and a half-inch of rain fell at stations 205 and 305 in Oregon. Cool and unsettled conditions on June 13th transitioned to warmer and drier weather by the 14th, although Harrington South still fell to 36 degrees that morning. Southerly flow from an approaching upper low caused very warm temperatures in the 70s and 80s on June 15th. 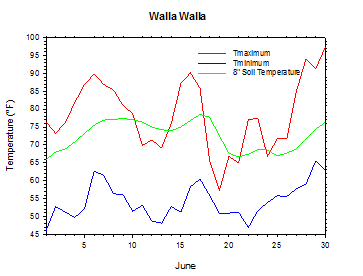 On June 16th, temperatures were as warm as 95 degrees at WSU Tri-Cities, while the overnight low at Wahluke Slope was only 68 degrees. High temperatures on June 17th were still in the mid 70s to 80s in many areas, except upper 60s at the coast, with lows in the upper 40s to 60s. A wetter period began on June 18th, as a frontal band stalled over central Washington. As much as one inch of rain fell in the region, with the heaviest values from Prosser to Moses Lake. High temperatures in rainy areas were very cool for late June, including a chilly 58 degrees at Royal City West. Showery and cool weather continued on the 19th, and then very rainy conditions returned to some locations on June 20th. Green Bluff's high temperature was only 49 degrees on the 20th, as 1.3 inches of rain fell in just 24 hours. Even more unusual was that the low temperature of 47 degrees led to a diurnal temperature range of just 2 degrees, which is extremely small for the summer season. Other sites including Davenport, Snohomish, and Lawrence also received more than one inch of rain on June 20th. A moist southwesterly jet stream once again pushed clouds and rain into the region on June 23rd. Rain fell in most of western Washington, including 0.62 inches at Montesano, while very light totals fell in south-central Washington. Highs were cooler than normal in the cloudy areas like Yakima. Rain fell in many areas on June 24th. June 25th was another wet and cool day, with highs only in the 60s and 70s. Significant rain fell in the lower Columbia Basin, western Washington, and some eastern areas of the state. One-third to one-half inch fell in the lower Columbia Basin, while 0.83 inches fell at Montesano on the 25th. It was somewhat drier but cloudy on June 26th, with highs remaining in the 60s and 70s. By June 27th, southern areas of central/eastern Washington had finally climbed back into the mid to upper 80s. Much of Washington was sunnier and drier, although rain fell in western areas, with one-quarter to one-third of an inch from the coast to Olympia. Areas from Wenatchee to Omak also had very light rainfall. The Northwest finally transitioned to dry and hot weather for the remainder of the month. On June 28th, highs reached the 90s in some areas. However, thunderstorms affected parts of Skagit County in western Washington on the morning of June 29th, as well as parts of central Washington during the day. In fact, three quarters of an inch of rain fell at Toppenish during a thunderstorm-induced deluge. Otherwise, sunny, hot, and relatively humid weather prevailed during the end of June. By June 30th, a few areas of the state reached the century mark, as sunny and dry conditions continued. The average June temperature at Prosser (WSU IAREC) was 66.6°F, which is 1.1 degrees above average. The average high temperature was 78.9°F, which is 0.3 degrees above average. The average low temperature was 53.0°F, which is 2.8 degrees (1.5 standard deviations) above average. The maximum temperature recorded last month was 95.9°F on June 30th, while the coolest daily high was 68.1°F on June 20th. Low temperatures ranged from 68.1°F on June 29th to 41.5°F on June 12th. Daily average temperatures ranged from 81.1°F on the 30th to 57.9°F on the 12th. The monthly precipitation total was 1.58 inches. 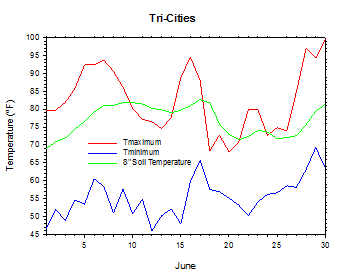 The average wind speed was 4.0 mph, and the average 8 inch soil temperature was 69.2°F. 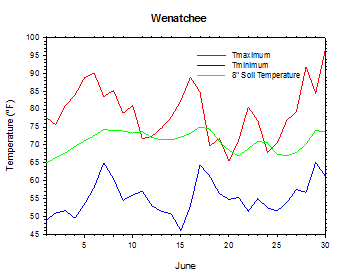 Wenatchee (WSU TFREC) recorded an average temperature of 68.0°F, which is 1.4 degrees above average, while Walla Walla's average monthly temperature of 66.4°F was 1.5 degrees above average. 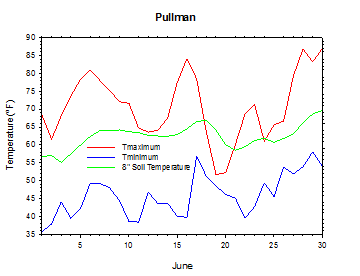 Pullman was one of the cooler spots in the state, with an average June temperature of 59.4°F. In western Washington, Mt. 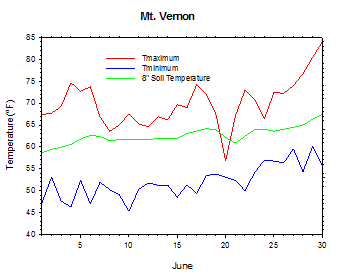 Vernon's average temperature was 60.5°F, which is 2.1 degrees above average. June 12th: The low temperature at Harrington South dropped to 34.5 degrees. June 18th: The high temperature at Royal City West was only 58 degrees. 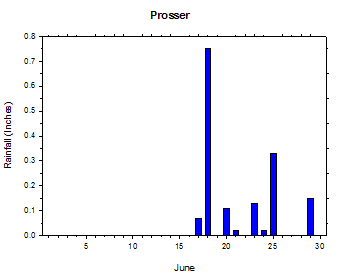 June 18th: 0.75 inches of rain fell at Prosser (WSU IAREC). June 20th: 1.3 inches of rain fell at Green Bluff, as the high reached only 49 degrees. June 30th: The temperature at the Tri-Cities soared to 100 degrees. Several episodes of rainfall in mid to late June were greeted with mixed emotions from growers. While cherry growers were concerned about splitting, wheat growers welcomed the wet weather and resultant increase in soil moisture. In Yakima County, apples and pears were growing nicely, while some cherry orchards will not be harvested this year due to a combination of poor pollination conditions, splitting, and a small crop load. Some cherry growers utilized wind machines and helicopters to attempt to dry their crop. Very hot weather at the end of June caused some western Washington growers to be concerned about possible adverse effects on crops, including sun scorch on fir trees. In central areas of the state, growers utilized shade cloth, irrigation, and sunburn protectant application to minimize the negative effects of the heat (National Agricultural Statistics Service). On June 23, 1992, the temperature at Moxee soared to a monthly record 105.2 degrees. According to the Climate Prediction Center (CPC), warmer and drier than normal conditions are expected in Washington during the month of July. Slightly enhanced odds of above normal temperatures and below normal precipitation will continue into the early autumn.